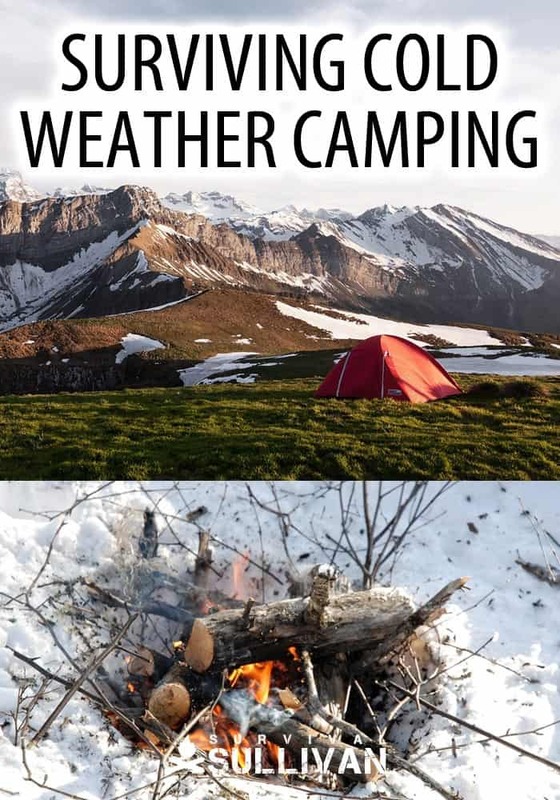 Although we might complain about the cold if we were heading out on a summer camping trip camping in Winter in the snow is an exciting challenge and can offer some wonderful experiences. If you are going to head out in the winter though you better be prepared, there is a saying “that any fool can be uncomfortable” but if you heading out on a winter camping trip you’d better be prepared because what might just be discomfort in the Summer could be deadly in Winter. Your first line of defence against the cold is your clothing, and it’s something often taken for granted as people focus on the ‘cooler’ pieces of equipment like tents, axes and stoves. You need to think carefully about clothes in cold conditions though because in the cold they do a lot more than just maintain your modesty. One thing you need to be aware of before dressing for the cold is that you will still sweat, even in extreme below zero temperatures. This can be particularly dangerous especially if you are working hard perhaps skiing, snow shoeing or cutting firewood and become damp with sweat. You will be chilled to the bone very quickly once you stop for this reason you need to select clothes which wick moisture away from your body and rather than relying on a single heavy garment for warmth build up your clothing in layers so that you can remove them as you need to prevent yourself from sweating heavily. As well as warmth this layering is all about managing moisture and making sure that you are not chilled by your own sweat. Natural wool is a good option for your clothing as it wicks moisture away from your body and is very insulative and even retains some of its insulating properties when it is wet. As well as your layers an outer shell to keep out the snow and protect you from wind is very important, your extremities are the most susceptible to the cold, finger and toes soon loose dexterity and as soon as they are chilled you will lose the ability to tie knits, use a knife or erect your tent which will put you in a very difficult situation. In fact the divers hand signal of touching index finger to thumb to form an ‘o’ comes from a test of dexterity to prove you are able to use your hands in the cold. To keep your feet warm wool socks and a trick I discovered while living in the Arctic North of Sweden was to use heavy wool or felt innersoles in my boots. Don’t wear so many socks or lace your boots so tight that your feet are squashed though otherwise the circulation to your feet will be reduced and you will start to feel numbness in your toes. Gloves are important too, a thinner set of gloves which allow you to still use your fingers dextrously are vital as are a heavier set that covers those for real protection but which might need to be removed from time to time to tie boot laces, ski bindings, light a fire or any number of other tasks which require fine motor skill. What your clothing is doing in the cold is insulating you from the air or anything else you come into contact with and slowing the transfer of heat from your body to whatever you are in contact with. It also creates a buffer of warm air trapped within the fibres of your clothing that’s why when you get into your sleeping bag on a cold evening or put a jumper on that has been outside your sleeping bag on a cold night it feels cold at first but quickly warms up as your body heat warms the air within the garment which then keeps you warm. That’s why down jackets and sleeping bags are so warm, they trap and awful lot of warm air in the ‘loft’ or space between their fibres and that in turn keep you warm. That’s why it is important to avoid crushing your down, or synthetic sleeping bags or duvet jackets, yes you can compress them when you have them packed into your backpack but don’t store them compressed as over time they will lose their loft permanently. That is also why down clothing is useless when it is wet as the feathers all stick together and it loses all its insulative properties. Your clothing, the pad you sleep on when you are camping, or the bed of spruce boughs you build to sleep on in the winter all insulate you from the air or the ground, your gloves insulate you from the tools you might be using; your ski poles, axe handle or the handlebars of your snow mobile. It is important to remember that some materials conduct heat away from you quicker than others; an aluminium shovel handle for example will conduct heat away from you one hundred times faster than ice would. So remember to wear your gloves or maybe wrap you shovel handle in something. One of the key things you will need to do when camping in cold weather is ensure you have something which insulates you from the ground, a bed of branches or a foam sleeping pad will be sufficient and may mean the difference between a good night’s sleep and hypothermia. The reason we need to insulate our bodies from the cold is that the human body only has finite reserves of body heat, you are warmed by you’re the metabolic breakdown of food which keeps your core temperature at 37.5 degrees centigrade and you can’t afford to lose all that heat. Your bodies only other methods of heat production are exercise and shivering. So you can warm yourself a little in the cold by keeping moving, doing star jumps or other exercise and will know when your body is taking things into its own hands when you start shivering. Beware when the shivering stops though as that is often a sign of hypothermia setting in. To keep your temperature up you need to fuel your body with food so surviving cold weather camping isn’t just about fire and shelter and avoiding frostbite, you need to feed yourself properly. Luckily, in cold weather camping scenarios there is rarely a shortage of water as you can melt snow and ice very easily, this means you can save weight in your pack by using dehydrated foods without every worrying that you won’t have the water you need to rehydrate them. In arid regions it is wise to carry rations that do not need to be reconstituted with water as the water you do have will be more precious as drinking water. Proper food at regular intervals is one of the keys to maintaining your core body temperature and surviving the cold. As well as the conduction of heat away from your body by just about anything you come into contact with the chilling effect of the wind speeds up your temperature loss to the surrounding air. While the wind may make it feel much colder than it is, it doesn’t affect the ambient temperature so it won’t cause water to freeze any quicker but you will feel colder and it will cause you to become colder quicker than you would otherwise. You need to cut down windchill to stay warm and comfortable, even in summer you will feel the effects of windchill on a sunny day if you hike hard and work up a sweat you will feel the cooling effect of wind very easily, that’s why it’s important to carry windproof kit even in the summer. In the winter it is even more important. As well as being able to keep the wind off you with your winter clothing you will need to keep the wind out of your shelter. Having wind blow into your shelter constantly will not only chill you but will be annoying enough to keep you awake and being well rested is an important part of survival that is often forgotten. Tents are the obvious way to cut out wind but when you are camping in cold weather it’s possible that it will snow and tents and tarps while great light weight expedient shelter options will struggle to shed a heavy fall of snow and might be crushed. To combat this log lean-tos have been used for centuries. They are harder to wind proof but a thick thatch of boughs and branches on top of the logs will keep out rain, snow and wind. The roof will need to be pitched quite steeply to shed the rain and snow and you do need to be careful that you construct it sturdily so that it doesn’t collapse and hurt you. Another advantage of lean-to shelters is that they can easily be combined with a long log fire to heat you at night, in fact before modern sleeping bags it was these long fires and lean-to shelters that kept people alive in the northern woodlands. 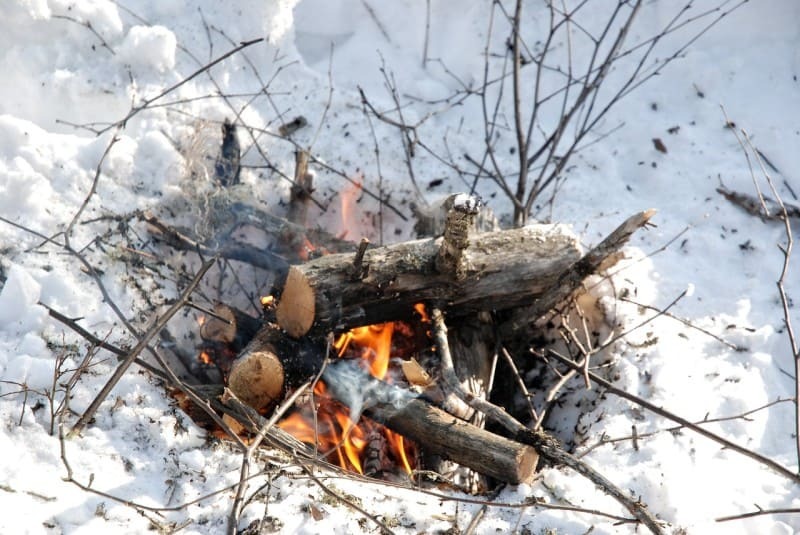 To make the most of a fire you should reflect as much of its heat towards you as possible, to do this construct a reflector from logs behind the fire to focus as much of its heat towards you as possible. Additionally something to reflect heat which passes you back is very useful, the inside of your shelter will do this to a certain extent but you could use the Mylar space blanket that you should always carry in your emergency or first aid kit as an additional reflector behind your bed to make the most of all the heat from your fire. A small fire of twigs will do little more than warm your hands so what you need for warmth is to use full logs, as long as your body, for your fire. You should seek out dead standing timber for these fires and preferably soft wood species that will burn easily. You will need a minimum of two logs, although three will be more stable. If you are working with two you will need to flatten one side of each, an axe is the right tool for this but it will be a laborious job. One log needs to be secured with the flattened face uppermost, it can be wedged in place with rocks, sticks or smaller logs. On the flattened surface you should then place sticks as spacers between the lower log and the next log which will be placed on top of the first. The second log should be placed on top of the first with the flattened surface down against the sticks you have placed as spacers. The space between the logs can then be packed with small pieces of kindling and fuel, the pieces you cut off to flatten the logs should be suitable. Then you can light this kindling which will in turn ignite the logs. With three logs you don’t need to flatten them, two logs will be placed on the ground and wedged in place, over these two logs you then place spacing sticks as you would with the two log fire and on top of those the final log can be placed above where the two lower logs touch. The space between the two lower logs and the upper can then be filled with smaller kindling and fuel which can then be lit. These fires take a while to get established but they are very warm and are easily large enough to burn all night. Another way to stay warm over night is to heat rocks in your fire and place them under where you are sleeping. You need to be careful that you don’t melt your sleeping bag or burn yourself so you will need to place the rocks under-ground a few inches of soil or sand should be sufficient. The disadvantage of these rocks is that they will cool long before morning and to get the benefits of them in the first place you will not be able to sleep on a deep bed of tree boughs or on a foam pad so you may find that you grow cold overnight. Fire is always important on camping trips even if it’s just used for cooking your food. In cold environments though it’s even more vital as it can provide the warmth you need to stay alive. That’s not to say that you absolutely must have fire to survive cold conditions, Antarctic explorers and Everest climbers don’t make fires, in fact they can’t light fires because there is no wood for them to use, but they go equipped with warm clothing, down jackets, tents and stoves for melting snow to drink and for cooking hot food. There are some environments where wood for fires simply won’t be available, in those situations you must have the right equipment to survive the cold. Being properly insulated from the cold is very important, a warm sleeping bag suitable for the very worst conditions you might encounter and warm clothes will be vital in these situations. For cold dry environments down is the best filling for your jackets and sleeping bags as it is less likely to get wet and become useless, but you must keep it dry or it will lose its insulating properties. To protect against moisture you could consider using synthetic fillings for your sleeping bag and coat as this is not so badly affected if it becomes saturated and not only retains some of its insulation but is much easier to dry out than down which takes a very long time to dry once soaked. The need to use these tips to survive cold weather camping becomes clear when you consider some of the effects of extreme cold on the human body. Hypothermia, frost bite and other difficulties are all very real risks. It’s important that you can recognize these conditions and treat them if necessary, one of the first signs that you are getting too cold is the loss of dexterity in your hands, it’s very important that you halt and reverse this as once chilled to the point of your hands being useless you are much less able to affect a self-rescue in emergencies. It’s highly recommended you take a first aid course to learn how to best deal with hypothermia. Beyond loss of dexterity loss of feeling and your skin taking on a pale waxy appearance are early signs of frost bite. These signs are most likely to appear in your extremities, fingers, toes and even nose and ears. If you spot these symptoms you need to act at once, gradually warming the affected area is vital, not over the direct heat of a fire but preferably by using your own body heat. Take an affected hand and reach into your armpit or groin and your body’s heat will warm the hand. If your foot is affected you may have to use a companions armpit! Hypothermia is a drop in your body’s core temperature, between 32 and 25 degrees centigrade you are hypothermic and below 32 degrees you will stop shivering and probably pass out. Hypothermia may manifest itself as a loss of dexterity, tiredness and confusion and needs to be treated immediately before it gets worse. It can be fatal and eventually those suffering from it will just want to sleep and when they do they won’t wake up. Hot drinks, exercise to increase your temperature and warming is what is required, getting into a sleeping bag, ideally with someone else as well to share their warmth and body heat should be enough to bring your temperature back up but it must be treated immediately. Make sure you avoid any of these effects by using my tips to survive the cold and remember to treat any symptoms immediately so you can enjoy your cold weather camping rather than have to endure and suffer through it. Geoff is a lecturer at Hartpury College. He has been teaching at colleges for eight years and in that time has worked at some of the most prestigious land based colleges in Britain. He trained as a professional hunter and game keeper and as well as his teaching job he still manages deer professionally as a deer stalker, carrying out culls, guiding clients and advising on deer management strategy. 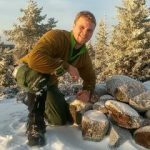 He has operated his own bushcraft and survival skills training companies since 2010 and has also managed outdoor and environmental education centers in Norfolk and Scotland over the course of his career. A keen traveler, Geoff has honed his survival skills in New Zealand and Scandinavia, he speaks fluent Swedish and has proven his bushcraft ability on many expeditions. Several of these expeditions were on long distance trails in the UK to raise money for Whizz Kidz a charity that supports disabled children, Geoff has hiked over 2000 miles in aid of this charity. Next Multiple Handguns for Carry or One Handgun to Do Everything?